Content productivity starts with understanding your audience, your message and your story, so you’ll make each piece of content count significantly towards your marketing goals. And it wasn’t a lot more work. (1) Just because you think a topic is hot doesn’t mean it’s right for you. You can get a sense of “what’s hot” by researching Amazon titles as well as blogs in your field. Notice who gets guest blogging gigs on top blogs and what they write about. But (as I’ve learned to my sorrow) just because a topic is hot doesn’t mean it’s right for you. The “hot topic” post may get tons of coverage but you barely benefit. That’s because some topics just won’t fit with your story archetype — the story that’s the foundation for your branding and message. Business story archetypes don’t use the formulas from fairy tales or movies. “The hero’s voyage and return” doesn’t usually translate to business environments. And big-brand stories won’t work for a small, entrepreneurial company. Beer, motorcycles and cola drinks get sold on the basis of image. The ad agency has to find a way to associate an inanimate object with stories in the customer’s mind. Your company sells you — a live, animated person who interacts with clients. You need stories that introduce you as a problem solver who’s easy to work with. Your clients work with a real person — not an imaginary creation of an ad agency’s creative department. Learn more about story archetypes here. Click here to download the report. Now let’s imagine we assembled three business owners, each with a different story archetype that’s the foundation of their brand. We challenge each one to write one post on the topic of productivity. Here’s what happens. The Role Model archetype might write a blog post about how she struggled to learn time management. She’ll talk about how she almost flunked out of college because she couldn’t organize her study time. She’ll write about how she tweaked her study schedule and ended up graduating with honors. The Educator archetype will write a blog post, “4 Productivity Strategies That Actually Work.” She’ll point to research that shows why some time management techniques are doomed to fail. Or she’ll emphasize the need to match your productivity strategy to your natural biorhythms. The Innovator archetype will write a blog post to share case studies of business executives who became more productive with her system — something she created that’s only available through her company. She’ll supplement with blog posts that demonstrate her creativity and cutting edge techniques. Once you’ve identified your archetype, you now have a framework for writing blog posts (or anything else). Notice it’s a framework – not a set of handcuffs. You can go off course every so often, especially when you reference other guest experts. (2) Don’t write anything unless you can use it at least three times. You send a message to your list. You revise the message to become a blog post. Then you take the same content and incorporate it into you new ebook. Or you turn it into a lead magnet. As you commit to the 3X promise, you’ll start seeing even more ways to recycle content. Nearly every time I write a comment on a forum or blog post, I find a way to incorporate that comment in an article … or even start a new article, blog post or video. (3) When it’s not coming together quickly, get help. When you’re spent days struggling with a sales letter, or your website project gets held up because you haven’t written your About Page … it’s time to get help. You’ve probably heard of ROI — return on investment. Successful business owners also calculate ROT. That unfortunate acronym stands for “return on time.” What are you paying yourself as you keep revising that sales letter or landing page? As I grew my copywriting career, I was surprised to find experienced, competent marketers hiring me to write their copy. They were perfectly capable of writing their own copy. But they realized they had a better use for their time. After all, I do this all day long. I can do it faster. And because I’m not too close to the project, I can bring an angle they can’t. You may not need a full-blown writing project. My Story Consultation will help you figure out why your copy isn’t working. 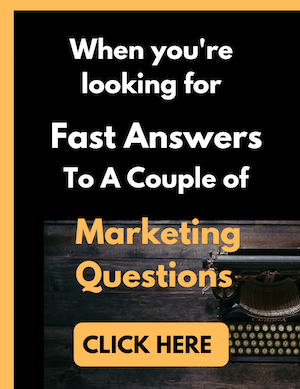 You’ll get solid ideas that will get the project finished and generating revenue faster … and you just might find a new way to view your marketing. Click here to get started. I’ve been writing about content productivity and looking for systems for a long time. Then I came across this guide from Dennis Becker, just released at a very good price. When it comes to content creation, I’m not easily impressed. But I really like the system Dennis presents. I’ve attended a lot of presentations where gurus (or guru wannabes) made a big deal about creating one type of content … articles, blog posts, podcasts, or videos. Dennis share methods of not just creating content easily, but also how to repurpose each type of content to another format, so that you end up with greater copywriting productivity — getting yourself out there in front of the major players in your target audience. Dennis show you how to create 10 pieces of content in each of 5 different formats in one month. I reviewed the plan and it’s very do-able (in fact, I’m going to be working through this program myself – it’s just what I’ve been looking for). 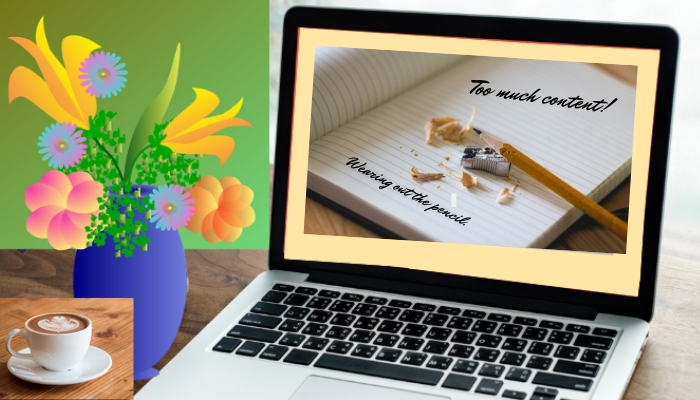 You may be able to repurpose each of these 50 pieces of content (such as turning a blog post into a Powerpoint video and then strip out the audio portion to make a podcast episode, and then maybe also post the article to Facebook and to an article directory. The content creation of 50 content pieces in a month might take you around an hour a day, 5 days a week, and then maybe a little more time spent repurposing each. Of course, any or all of this process could be easily outsourced if you wanted. Dennis calls this the 5×10 system and you can get your copy here. And if you’d like to work with me on identifying your story brand, developing your content strategy, and strengthening your message, let’s set up a consultation here.